A review of Expressions: Taking Extraordinary Photos for Your Scrapbooks and Memory Art by Allison Tyler Jones. Photography instruction for scrapbooking and memory art. Focuses on creative new ways to capture the most popular photograph subjects, family and everyday life. Offers additional tips and suggestions for designing unique, expressive scrapbook pages and memory art. Great-looking and memorable photographs are the centerpiece of any scrapbook. Now, scrapbooking and memory art enthusiasts have a photography instruction book written just for them. 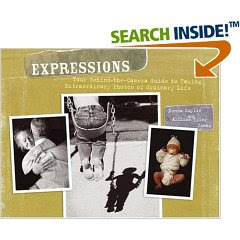 Expressions reveals how to create extraordinary photos that will make any scrapbook or display project a vivid record of special events and everyday life. Focusing on portraiture, the book follows the family life cycle, from babies to grandparents, with each subject explored from a fresh perspective. I love, love, LOVE this book!! This is wonderfully inspirational! For me, it was the perfect balance of text (basic explanations and ideas) and photo examples by some extremely talented photographers. This book is all about photographing people (the author says as much right in the introductory paragraph), so you won't find photos of inanimate objects or sweeping landscapes, but aren't scrapper's mainly about people anyway. It gave me a ton of ideas for future photos of my daughter. I also love that that in the back of the book, it offered links to the websites of several of the photographers featured in the book - I checked them out - even MORE great inspiration!